Review written by Antonia Lister. 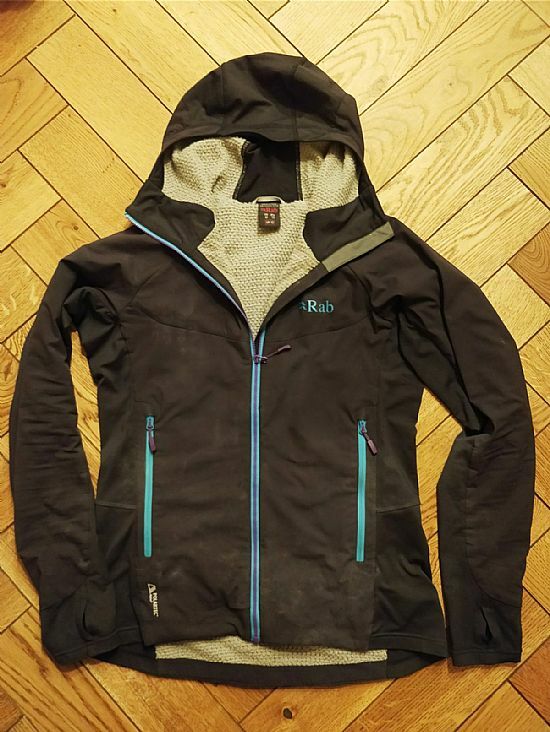 The women’s Alpha Flux Jacket from Rab is a lightweight, lightly insulated jacket intended for ‘multi-season active use.’ The super soft, stretchy outer allows for full freedom of movement when climbing, while strategically placed stretch fleece lining panels provide warmth where you need it. The inside length of each arm and both sides of the torso are unlined for breathability (‘to let the stink out’) and to save on bulk. Thumb loops keep the sleeves where they’re supposed to be. The low-profile, stretchy hood fits under a helmet (I call this look ‘turtle mode’) and is fleece lined on the sides to keep those ears toasty warm. Even so, on really cold days I'd still bring a hat. The zip has an internal storm flap and an excellent little fabric flap at the top to stop it scratching your chin (trust me, it matters). 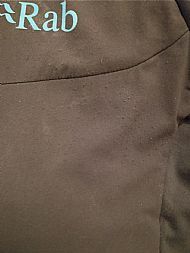 The two front zip pockets are lined with a soft mesh fabric which my often cold, rock-battered hands appreciate. The Alpha Flux is slim fitting and is cut quite long which is great for keeping you warm and fitting under a harness. Practical - yes, but looks-wise I prefer a slightly shorter cut. That said, no one else seems to care. This jacket is a looker! Bright blue and purple detailing against the sensible grey - yes please! Expect regular compliments whenever you wear it. A friend even asked to try it on the first time I wore it. I told him he didn’t look that great in it... but I was lying. The fleece lining is lovely and warm, and while the outer is comfortingly soft, Rab’s claim that it’s durable is optimistic! 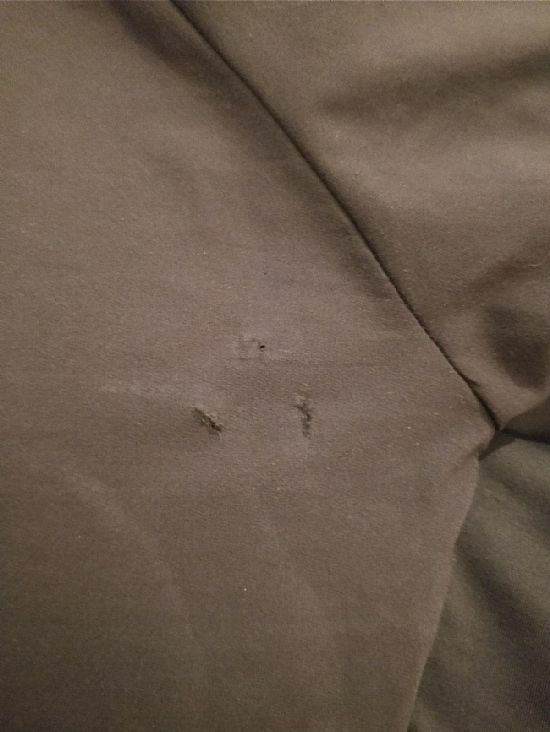 After only a handful of wears, during a totally bramble-tastic climbing mission in the deepest jungles of Northumberland this summer, I was surprised to find a couple of small holes in the outer. I assumed a thorn had torn the fabric - enough had found their way into our forearms and calves that day! But according to my climbing buddy they’d been there since our leisurely amble up a VDiff on Gouther Crag - hardly the sort of trip you'd expect to put your kit through its paces. At least the nature of the fabric seems to prevent fraying or loose threads, so they don't seem to be getting worse. On top of this, the fabric has started to bobble a little on the chest where it's rubbed by the arms. The jacket's lack of bulk and stretchiness makes it great for layering, but if you're wearing it as an outer, be gentle. The sizing makes sense, which is impressive for any type of womenswear. I’m just under 5’8” and usually wear a size 10 - 12ish, so I went for a 12 to make sure it allowed enough movement for climbing and a couple of thin layers underneath. Goldilocks would be pleased; not too roomy, not too tight. You could probably get away with a smaller size if you like a neat fit or only intend to wear it over a baselayer. 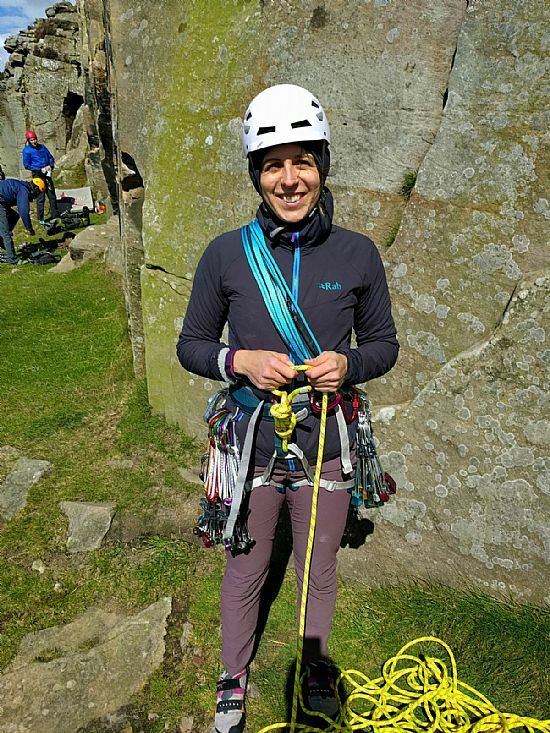 The pockets are accessible when wearing a backpack and you can still get at the zip pulls in gloves, but they sit squarely under my climbing harness meaning you can't stash anything that you wouldn't enjoy digging into you for the length of the climb. Goodbye phone and keys, hello squashed and melted chocolate bar. But did I mention the purple and blue colourway? Ooph! I’m not into jargon so I purposely avoided mentioning terms like ‘Thermic-lux™’ or ‘Polartec® Alpha™ “Direct” 90’ (which I think are two different ways to say clever warm fleecy stuff). But I will let you in on a secret. 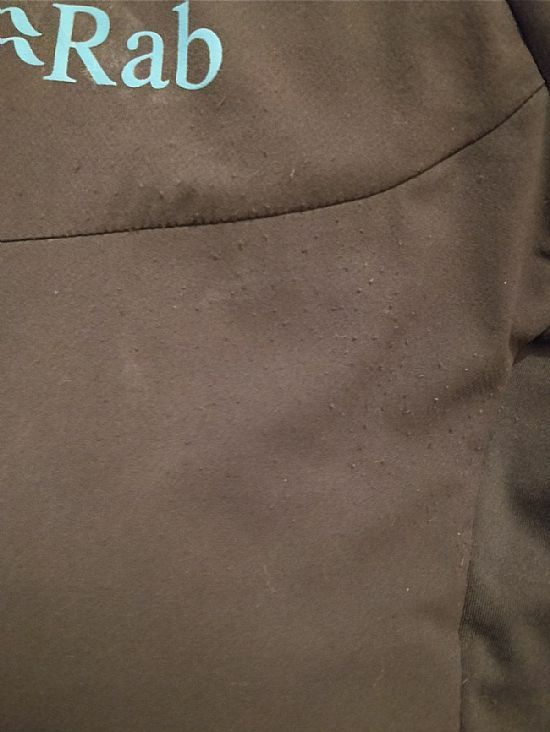 I have worn this jacket on 10+ climbing day trips and weekend adventures, plus a couple of sessions at the recently sub-zero bouldering wall and I have never washed it. Not only is it not standing up and walking around on its own, it doesn't even smell bad! So whatever ‘Polygiene® STAY FRESH odour control’ is, it bloody well works. Stretchy and long-armed. Good for climbing. Hood fits neatly under helmet with no excess fabric. Your friends will want to try it on (which significantly reduces its ability to keep YOU warm). Your friends will probably buy themselves one and then you’ll all match. The hood makes you look like a turtle. All in all, I love this jacket. It has come with me on every climbing and hill walking trip since I bought it, except that one time I forgot it and hated my stupid cold self for the whole trip. It was tough. Price-wise, £140 seems a lot to spend on any item of clothing, particularly when you could pick up a cheap fleece for a few quid. But with the Alpha Flux, the technical fabrics, well-thought out details and attractive design really make a difference when you've got it on, or when it's busy taking up hardly any room in your pack. For all the use I’ve had from it so far, and for every future trip I'll take it on, I’d say it's worth it.